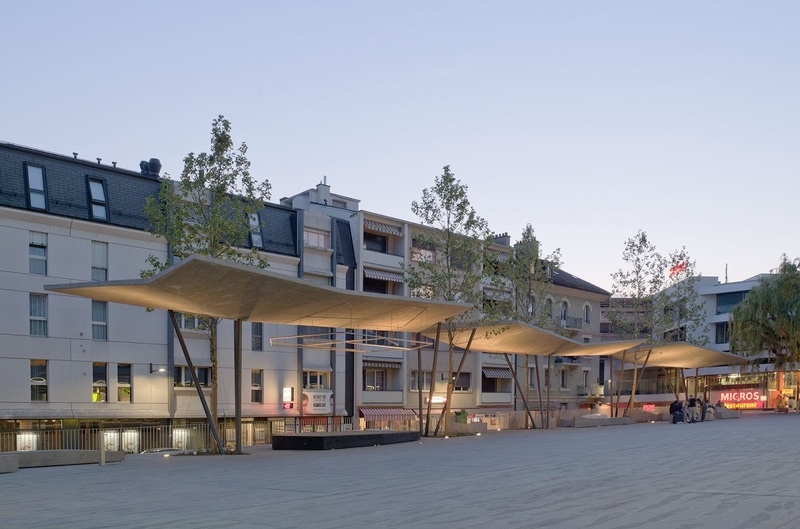 An exceptional structure in any terms, it has been formed using thin slabs (15cm maximum thickness) subtly suspended amid five magnificent lime trees planted along the edge of the square, along the rue du Midi. 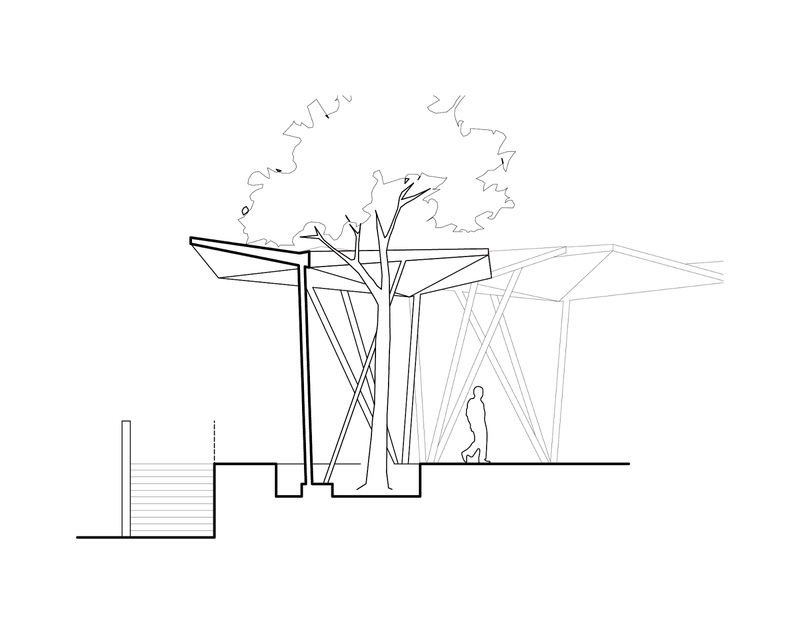 As if supported by the trees, the discontinuous lines of the canopy give the structure a vibrant natural aspect. 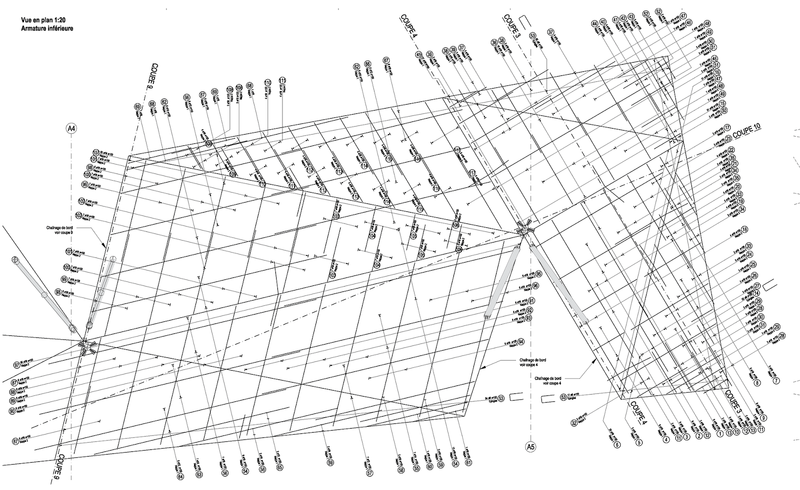 The folding form, with its large triangular pieces, creates a structure with considerable reach and affords spacious and varied emplacements beneath. 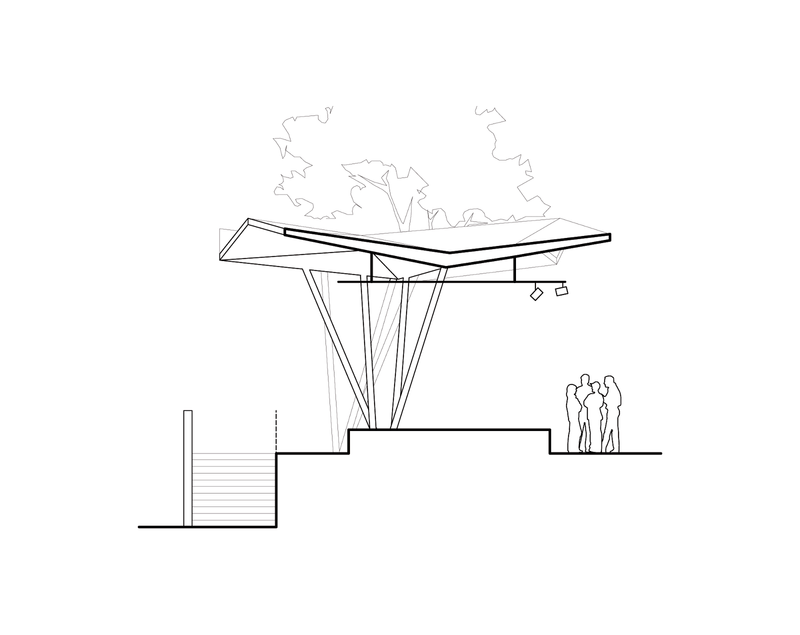 The undulating lines of the canopy, punctuated by the trees, shelter the square's urban furniture: a stage for open-air shows, several benches for gentle relaxation, and games for children. The warmth of the wood used here contrasts well with the flowing mineral lines of the canopy creating a natural link between the canopy and the pavement below. The supporting pillars, three metallic struts, are artistically blended with the trunks of the trees which line the arcade. They rise from the ground spreading upwards creating a protective frame around the trunks of the trees. 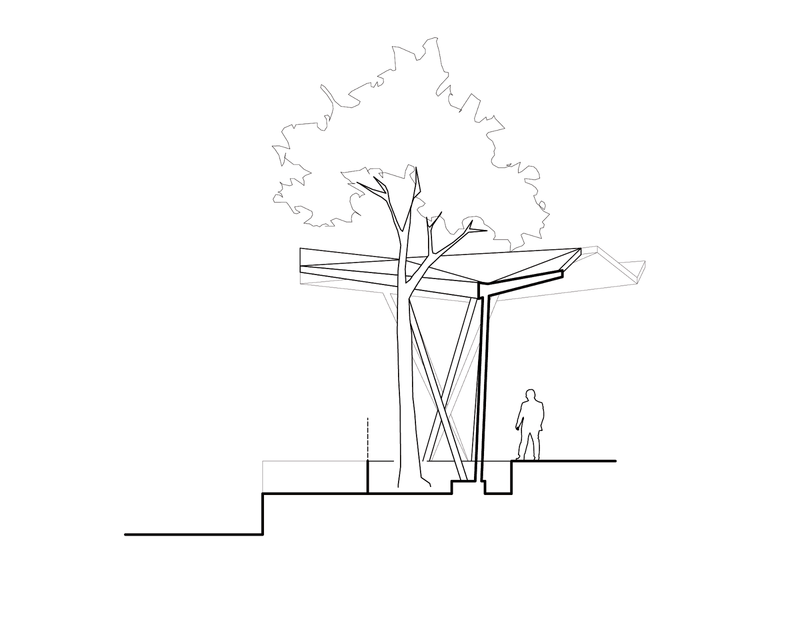 On the ground, cut into the pavement, a triangular grill, reflecting the shapes of the slabs forming the canopy, is the foothold for both the supporting pillars and the trees. Rainwater collects in the hollows formed by the roof structure, and is guided into the hollow pillars from where it flows down to the grill, creating a natural watering for the trees. This marriage of mineral and green in the construction enables the ensemble to reflect the change of seasons. 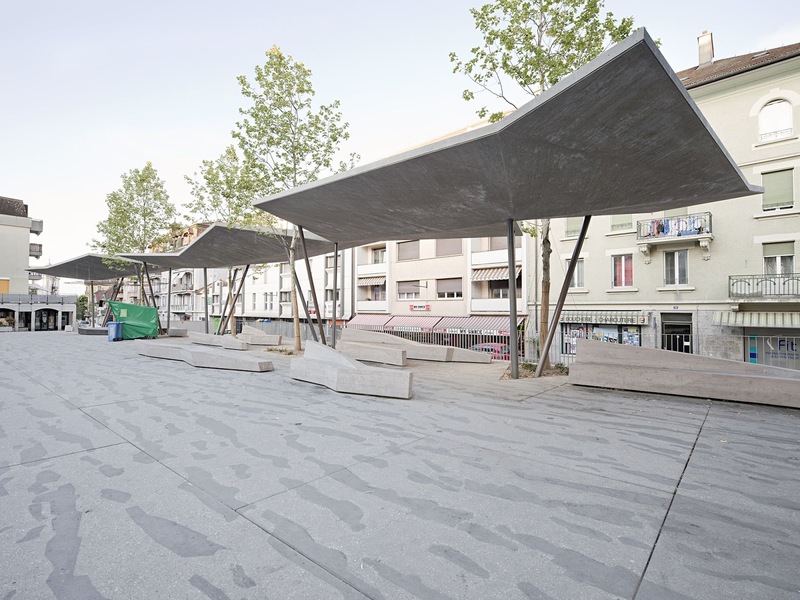 Firmly planted in the pavement of the Market Square, the cover creates an atmosphere at once urban and rural, ideal for relaxing and friendly exchanges with others. 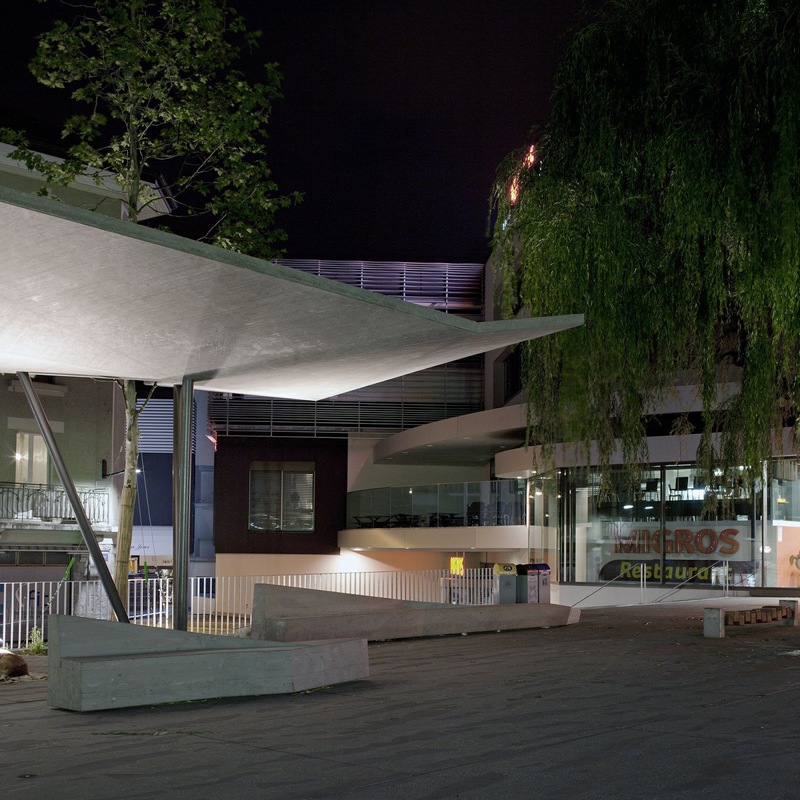 At night, a discreet lighting highlights the undersides of the canopy. 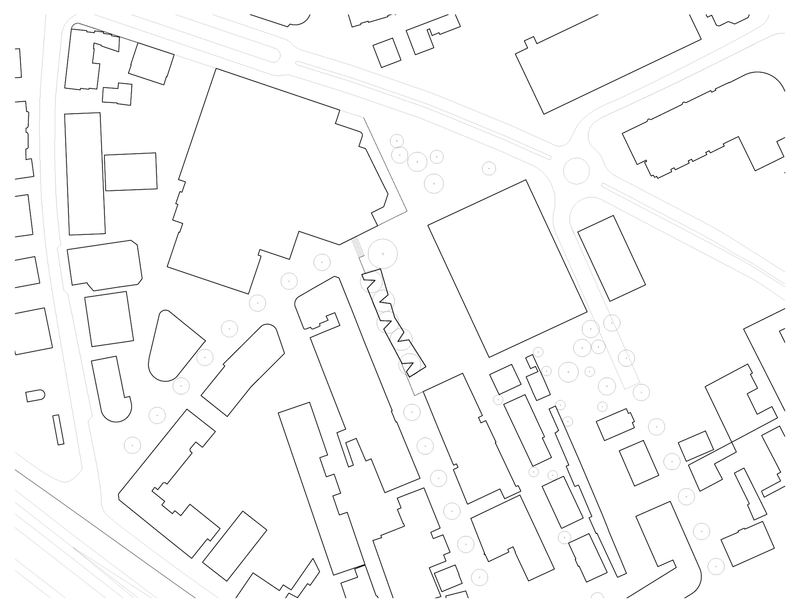 The soft lines around the edges tend to enhance the feeling of a watchful, strong, presence at the heart of Renens’s town centre. This symbiosis between architecture and nature extends even to the construction procedure itself, as a witness of the discreet traces left by the wood of the mould used to create the concrete forms, a sort of photographic negative of the creative process. 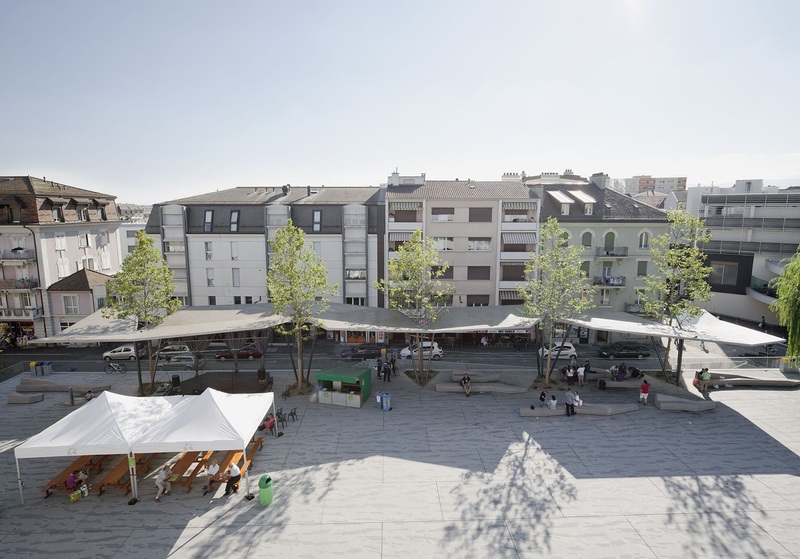 This major architectural undertaking is a subtle embellishment to the existing surroundings and an important addition to the heart of Renens. The symbolic form of the arcade will enable all the various activities that take place in and around the Market Square, and indeed all the local inhabitants, to feel at home.